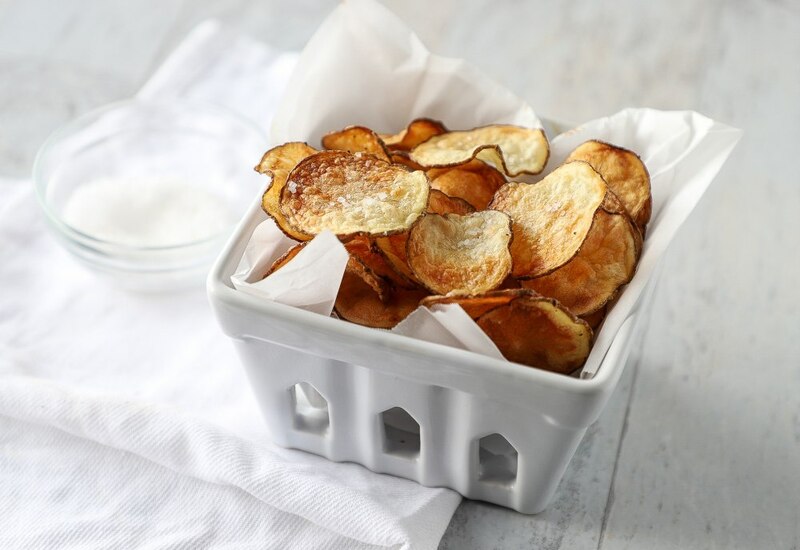 Four simple ingredients are all you need to make perfectly crunchy potato chips without all the oil from deep frying. Slice a potato, add oil, salt, and pepper, and cook them in the air fryer for 15 minutes. That's it! These potato chips will please everyone from kids to adults to vegetarians to Whole30 to gluten-free lifestyles. Make a batch for happy hour, an impromptu get-together, or just because. For best results, use a mandolin with the “thin slice” blade to cut the potato. Some air fryers do not require you to flip the food to cook evenly on both sides. But if your air fryer does, then flip the chips halfway through cooking. Potatoes can easily overcook, so monitor closely for doneness. Garnish chips with fresh herbs and additional seasoning, if desired. Per Serving: 210 calories; 14g fat; 19.2g carbohydrates; 2g protein; 0mg cholesterol; 277mg sodium. I made these to pack in my kids lunch bags and they absolutely loved them. The fact that they aren't deep friend and are still super crunchy was a huge plus. I made one batch with bbq seasoning and one back with sea salt and cracked black pepper. These chips are the perfect comparison to the Kettle Cooked brands of chips. My wife made these for our college basketball watch party and they were a huge hit. What makes them so great is that you can add your own seasoning to keep things interesting.